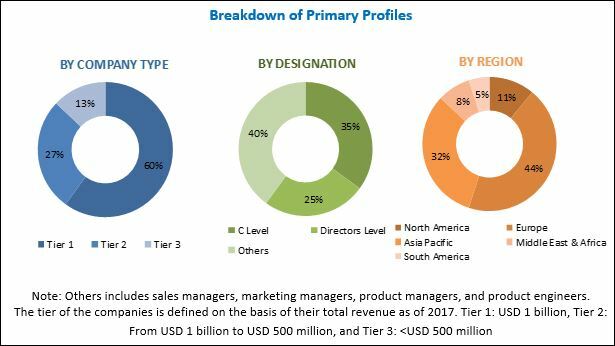 [119 Pages Report] The global heat meter market is estimated to be USD 797.2 million in 2017 and is projected to reach USD 1,218.9 million by 2023, at a CAGR of 7.50% during the forecast period. This research study involved the use of extensive secondary sources such as press releases, investment reports, industry white papers, presentations, district heating associations, journals, database, and other publicly available sources to identify and collect information useful for a technical, market-oriented, and commercial study of the heat market. The primary sources include several industry experts from the core and related industries, preferred suppliers, manufacturers, distributors, service providers, technology developers, standards and certification organizations from companies, and organizations related to all the segments of this industry’s value chain. The research methodology has been explained below. After arriving at the overall market size, the heat market was split into several segments and subsegments. The figure given below illustrates the breakdown of primary interviews conducted during the research study on the basis of company type, designation, and region. The leading players in the heat meter market include Danfoss (Denmark), Siemens (Germany), Diehl (Germany), Wasion Group (Hong Kong), Landis+Gyr (Switzerland), Itron (US), Zenner (Germany), Ista (Germany), Elster (Germany). 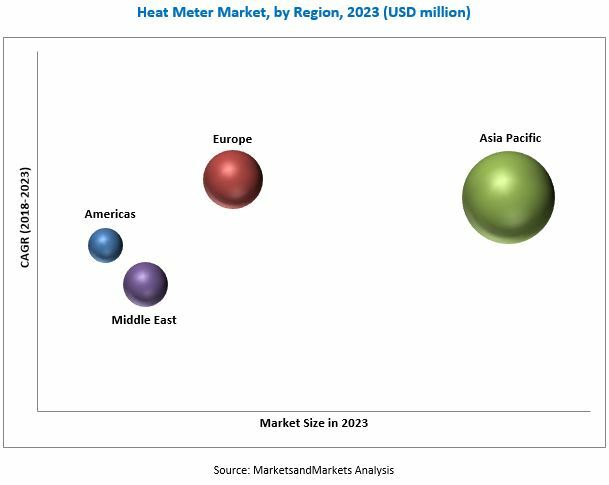 The global heat meters market is projected to reach USD 1,218.9 million by 2023 from an estimated USD 849.1 million in 2018, at a CAGR of 7.50%. This growth can be attributed to factors such as the requirement for the accurate measurement of heat consumption, legislative mandate to install heat meters, and increased savings through heat conservation. The heat meters, by type, is segmented into mechanical and static. The static heat meter segment held the largest market share in 2017 and is projected to grow at the highest CAGR during the forecast period. Static meters are available in a wide range of flow rates, which are used in building technology and automation and in district heating. Furthermore, static meters use a fluidic oscillator principle for providing reliable flow and energy readings. The report segments the heat meters market, by connectivity, into wired connection and wireless connection. The wired heat meter segment is expected hold the largest market share during the forecast period. The trend is expected to change soon with the growing awareness about wireless connection. The report segments the heat meters market, by end-user, into residential, commercial & public, and industrial. Residential heat meters segment held the largest market share in 2017 and is projected to grow at the highest CAGR during the forecast period. Increasing consumer awareness and growing installation of heat meter have empowered residents to have control over their energy consumption. Residential heat meters have witnessed a large-scale adoption in the residential sector, which includes large multifamily buildings, luxury apartments, and single-family homes. In this report, the heat meter industry has been analyzed with respect to four regions, namely, Americas, Europe, Asia Pacific, and Middle East. Asia Pacific is estimated to be the largest heat meter market from 2018 to 2023. The increase in construction activities and change in climatic conditions offer high growth opportunities for the heat meter market in this region. Furthermore, rapid urbanization in China has raised the demand for thermal comfort, which is likely to drive the heat meter market. These factors have made China one of the most lucrative markets for heat meter manufacturers. Capital cost associated with heat meters and the increasing competition from alternative heat sources could act as restraints for the heat meter industry. Consumers with centralized heating systems are increasingly in favor of heat meters but often cannot afford them. It is also observed that in some cases, district heating service providers are reluctant to bear the cost of heat meters as it further adds to their operational expenses. The growth in other alternatives such as renewable heat technologies, which have several policy support and legislative incentives, is expected to weaken the need for heat meter installation. The global heat meter market is dominated by a few major players that have a wide regional presence. The leading players in heat meters market are Siemens (Germany), Diehl (Germany), Danfoss (Denmark), Kamstrup (Denmark), and Wasion Group (China). New product development was the most commonly adopted strategy by the top players. This was followed by investments & expansions and contracts & agreements. Figure 14 Static Segment is Expected to Dominate the Market During the Forecast Period.